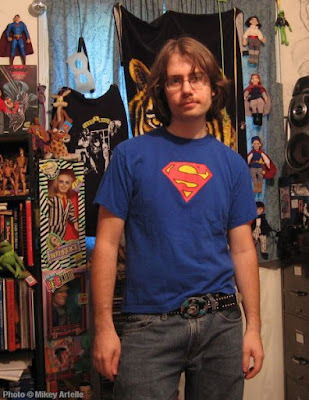 In my room with some of my collectables when I was 30, in 2004. I like this picture because of how slim I was (150 lbs. and size 28 jeans!). Unfortunately I have a rather forlorn look on my face in this photo! Poor Mikey!!! It seemed like the perfect segue to the next section... a tale of unrequited love. Although it's been a long, long journey, I finally, honestly feel that it's okay to be gay. I've still got some work to do regarding my internalized homophobia when it comes to social situations, and I'm making progress. Of course, what would make this all worth the effort, and a heck of a lot easier, is to find a partner. I've had a few boyfriends over the years, and more than once had fallen in love thinking that I had found my soul mate, but social taboos about being gay were still too dominating at the time and got in the way. It's difficult for a relationship to blossom when your boyfriend has a homophobic family, or he hasn't accepted that he's either gay or bisexual, or when neither of you are able to cope with the reality of actually being in a gay relationship. Such unrequited love was a common experience for me in my 20's and 30's. So while I'd love to write about what it's like to be in a steady gay relationship that has stood the test of time, and tell you all about the big happy ending, quite frankly I'm still working on that. This is the graphic from a T-shirt available on Amazon, which I relate to very much! 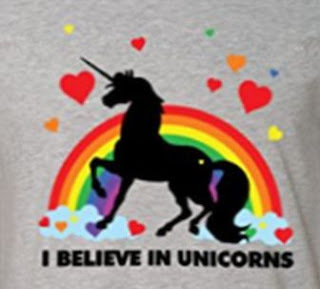 Now that I'm into my forties finding my soul mate will no doubt be a challenge, especially as within the gay community I'm known as a "unicorn". That is to say, I'm a gay guy who is looking for a long term relationship rather than quick one night stands. I'm not making any judgment calls about which lifestyle is better, "live and let live" is my motto. However for me, I'd much rather live the life of a unicorn! It's just in my nature to be the romantic type, so that will never change! I want the moonlit walks, the cuddling while watching a movie together, and finishing each others sentences. I think all that stuff is so cute and adorable, I just love it, and I'm looking forward to it! That being said my soul mate isn't a figment of my imagination either. He exists and he's out there just as I am, we just haven't found each other yet... or we have and just haven't realized it! This photo of a cute gay couple was found online. I love this picture, these guys are so adorable! Of all the gay folks that I know, those who are couples in a committed relationship seem to me to be far happier as compared with gay guys who have remained single. This reaffirms my belief that I'll someday find my own "unicorn", as they don't seem to be quite as rare as some folks in the gay community would like to think. In any event, I trust that the day will soon come when my future boyfriend and I are walking hand in hand in a public place without a care in the world, just happy to be together. And that's exactly as it should be, because love is love... which is really all that matters. 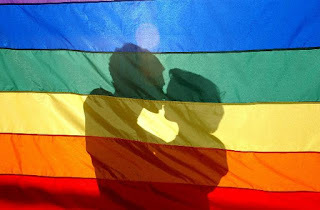 A heartwarming image: The silhouette of a cute gay couple and the gay pride rainbow flag.